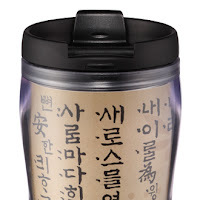 Cynthia & Obsessions ♥: AWWWW-MAZING KOREAN TUMBLER ! Hey everyone! I was going to write a BB cream review but thought this one was more worth it since I'm currently travelling in Korea! I was actually looking for such tumbler FOREVER (or...anything with such design) but I never thought that I would find such tumbler in Starbucks! I was just there for green tea latte (I know, this sounds like a typical Asian...) and found this tumbler! I'm soooooo proud of myself! with all verbal system of Korean language for the illiterate. 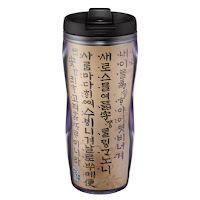 Starbucks website (here) explains that this 28 character-based writing system was dubbed "Hunminjeongeum" in 1446. This book is included in UNESCO's Memory of the World Register in 1997. Probably for cold beverages :( but I still love it! I'll bring it hither and thither! But other than that, it is very Asianly-vintage and stylish! Ohemgee, I have never seen a nicer tumbler before! but the letters themselves become the design! How great is that :)? so go purchase one for yourself and save the Earth! I don't know how many of you can read Korean but Cyworld (one of the most famous Korean websites) has chosen the Korean version of this post (and slightly different) as "today's recommended post" :) thank you cyworld!